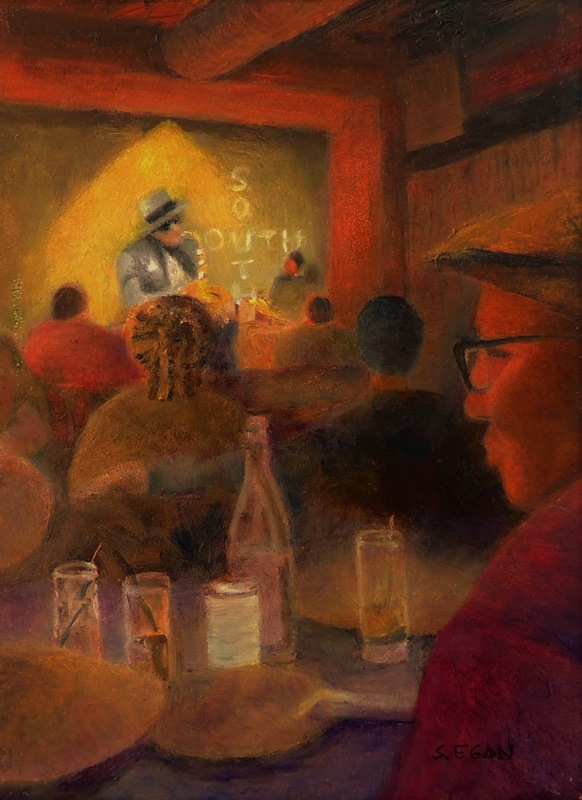 "South" accepted Philadelphia Sketch Club Small Oil Show! "South" has just been accepted into the Philadelphia Sketch Club Small Oil Painting Show! Of course I'm thrilled, especially because this is my first entry into a show in the city. So many good thoughts are running 'round my head: hmmm, can I list them all? First this painting captures an unexpected lovely night out on the town with Husband and Daughter. We were overjoyed with our good fortune at being seated in the jazz section, which normally requires a ticket, because the restaurant was overbooked. 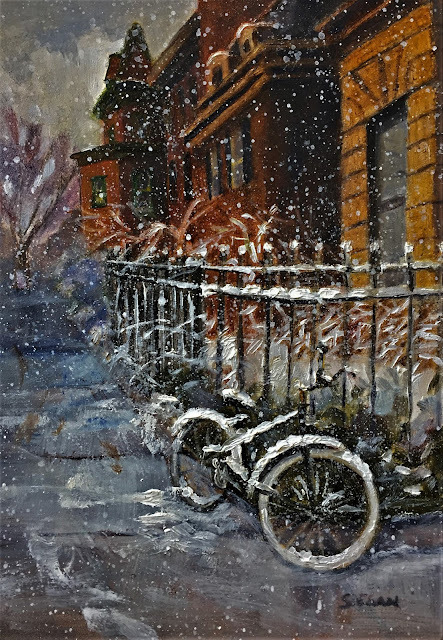 But more than that, this painting captures what we love about being in the city - just being able to pop in and find excellent quality fun after 9PM on a Thursday night. And we have another such night in our future, to be sure, when Spring Term is over, Husband will be finished teaching and daughter will have completed her term. When I fetch them for a ride home on that night, where will we head? South, of course! I posted this painting a while back and made a few changes. I darkened and warmed up the beams surrounding the stage and removed the onstage microphone. I posted this one on that page for a Before and After view. 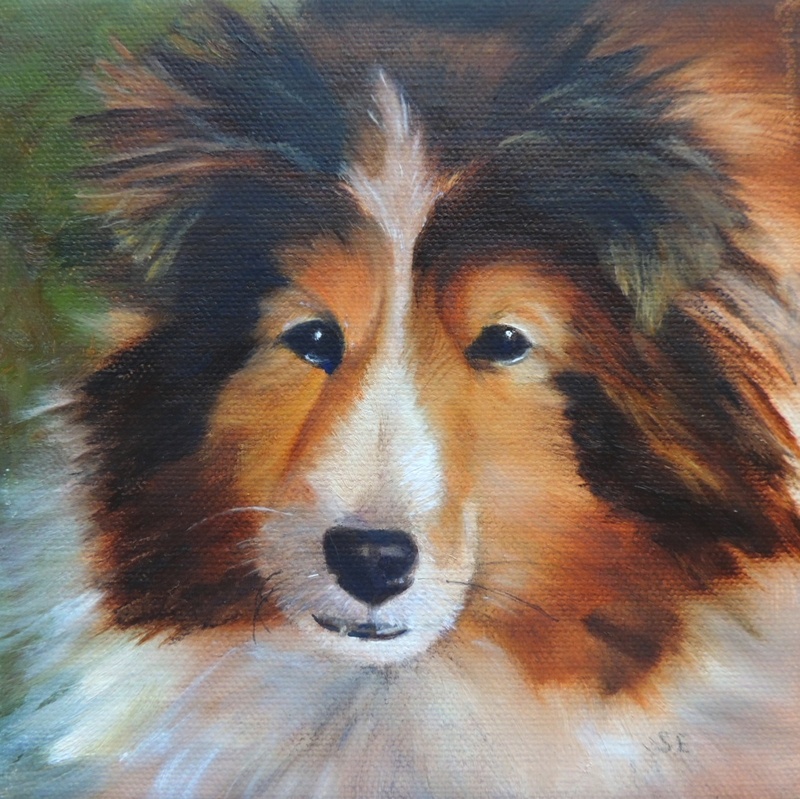 Our beloved Shetland Sheepdog has become an angel. We will always love her. "Pear in Phoenix Bird Cup"
My daughter Maura is preparing for her senior thesis show at Pratt. Her show will celebrate women artists as each in turn is asked what feminine identity means to her. As I struggle to answer her query, I find myself looking around my studio at my own work. How do the images I paint reveal my own feminine nature? My studio walls are hung with watercolors of the Delaware River, rendered in fluid, poured color. The very act of pouring paint feels feminine to me. A release of life blood. Small paintings of apples and figs reveal ripeness and promise: to bear fruit is to give life, to be fertile, to eat fruit is to be nourished. 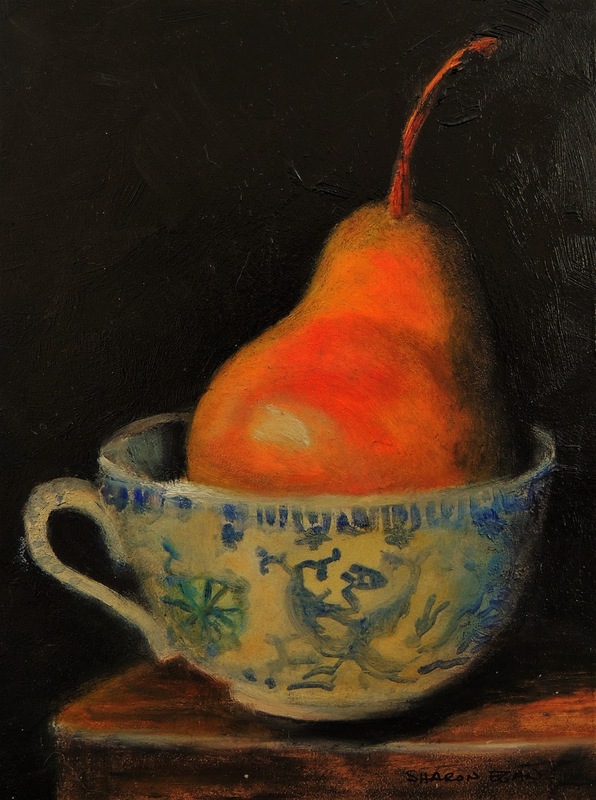 A painting of an ample pear placed inside a delicate antique china cup feels strong and curvy, yet fragile, like me. Paintings of my family abound. My recent cityscapes feel the least feminine, still, through my womanly eye, they reflect moments of quiet beauty or happy circumstances, scenes of everyday harmony, that which we wish for. I am not a painter of disquiet. In scenes of chaos and fear we must look for the helpers. Bad things will always happen, yes, but there will also always be the helpers. In crisis, to the helpers we turn. But for the soul we turn to family. To friends. Food. Music. Art. To the idealized, wise grandmother to be soothed and tucked in. It is she, and the crone archetype with which I most identify, who will make chicken soup and tell you each day is a new day, full of possibility.